1 of 3 Bring a large pot of lightly salted water to a boil. Blanch asparagus in boiling water for 2 minutes. Remove to a bowl with a slotted spoon and run under cold water to stop cooking. Return water to boiling. Add orzo and cook according to package directions, about 9 minutes. Drain and rinse with cold water. 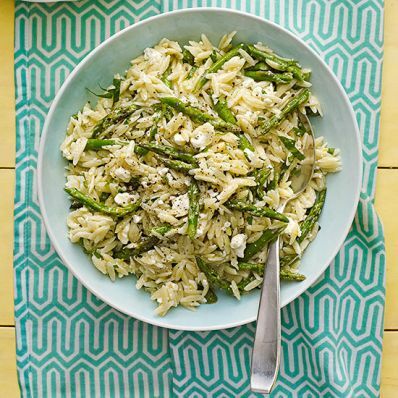 2 of 3 In a large serving bowl, combine orzo, asparagus, feta, parsley and lemon zest. In a medium bowl, whisk lemon juice, yogurt, sugar, 1/4 tsp of the salt, the pepper and oil. Set aside 1/4 cup of the dressing; add remaining dressing to salad along with remaining 1/2 tsp salt. Toss to combine; refrigerate until serving. 3 of 3 Immediately before serving, toss salad with reserved 1/4 cup dressing. Serve chilled or at room temperature.